Through a voluntary personal project constructed individually with the educators, the program aims to allow these teenagers to break with their usual living environment. In contact with the adult world and the requirements of navigation. 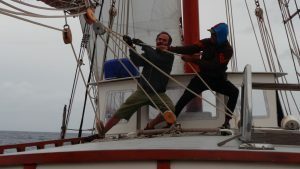 The sailboat Mauritius has undergone a major remediation project in Portimão, Portugal, from 2016 to 2017. At the same time, it was placed under a Swiss flag (Gibraltar before). An official recognition as a place of placement by the “Service d’autorisation et de surveillance des lieux de placement (SASLP)” of the Canton of Geneva in order to accommodate young people (both boys and girls) placed by partners the Juvenile Court and the Juvenile Welfare Service of the canton. 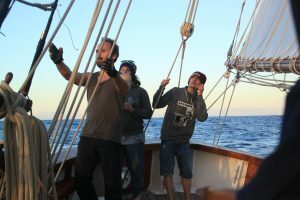 In line with the philosophy of the association, the ailboat also welcomed a number of first passengers who wanted to explore the open sea on a “working boat” dedicated to “doing together”.